New Tiger Trout State Record caught at Scofield Reservoir in 2012! Restrooms are now closed at Scofield. All water has been turned off. 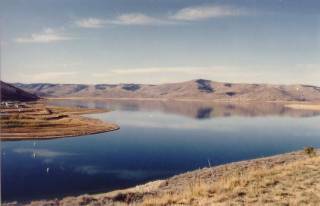 Scofield Reservoir is one of Utah's most popular trout fisheries, second only to the world famous Strawberry Reservoir . Scofield offers excellent fishing year-round (ice fishing in the winter) both from the bank as well as from a boat. It is much easier to fish Scofield from the shore than it is at lakes like Strawberry or Jordanelle Reservoirs. Tiger Trout were introduced to Scofield Reservoir in early 2005, so by now they are reaching catchable size. Although they will be fairly small this year, they are beautiful fish and will provide plenty of angler enjoyment. Make sure to release these beautiful fish so that they can grow even bigger. Fly fishermen do extremely well here fishing from float tubes and pontoon boats. Some flies that work very well are olive, brown or black wooly buggers or leech patterns, nymphs such as pheasant tails, or at times dry flies as well. Bait fishermen do well with Powerbait©, worms or small whole minnows. Trollers often do very well as well, using rapalas, flatfish, needlefish, wedding rings and many other trolling lures.